I fell in love with opera when I was still living in Honolulu. I had the opportunity to perform with the Hawaii Opera Theater as a dancer in the chorus for their production of Aïda. The singers were incredible: I couldn’t get over how they produced such a sound. It seemed like something they did with their whole body – I could feel the vibrations radiating from them in waves. It was amazing. I had a huge crush on the bass, mostly because the walls shimmied when he spoke. He had me at (three octaves down) “Hello”. The other thing that was exciting about the opera was the elaborate process that we all underwent before ever getting on the stage. I’ve been a dancer and actor all my life, and getting into costume and makeup had always been something I had done myself. Not so with Aida. It was an assembly line! We stripped, and were ushered into showers where they sponged us all over with body paint, and then dressed us in our costumes, and put our hair in tiny pin curls as we waited in line for wigs. After that was the line for the makeup team. When it was over, I hadn’t touched my tackle-box full of pancake and Ben Nye make up, and I was barely recognizable. It was really fun! Two years ago I replied to a job posting for a choreographer that had been forwarded to me by a friend who knew I had enjoyed choreographic work in the past. I was really excited when I heard back from Dicapo Opera – a company I had heard great things about when I had worked in the office at Gotham Chamber Opera. Since then, I’ve helped director Michael Capasso on many Dicapo productions. During that time he was extremely busy, which I later learned was because he was working to revive the New York City Opera! I am very proud to be working on this production and to be listed as Movement Coordinator in the program. It has been an incredible journey. 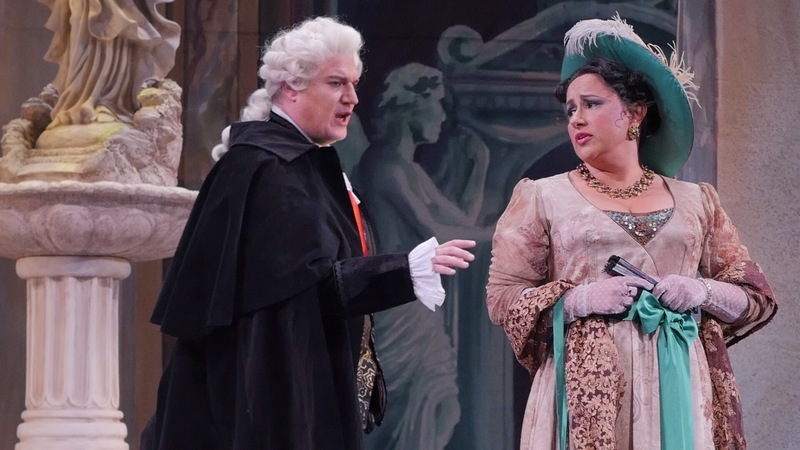 This week’s production of Tosca is the comeback performance for the new New York City Opera, now under the direction of Michael Capasso. Performances are January 20-24th at The Rose Theater in the Time Warner building at Columbus Circle. Tickets start at $20. I can’t wait for you to see this gorgeous production, with the costumes designed from the original 1900’s production, and the stunning sets. The music is phenomenal, and the singers will make you fall in love with opera. Open level Ballet classes every Tuesday 7-8pm and Saturday 12-1:30pm at Liberated Movement located at 380 Broadway, two blocks below Canal Street, Buzzer #5. All are welcome. Next Ballet Arm Positions ~ as easy as cake? I’ll be attending tonight! Very excited to see my first opera!! Yay! I’m so thrilled you’re coming!! See you there!